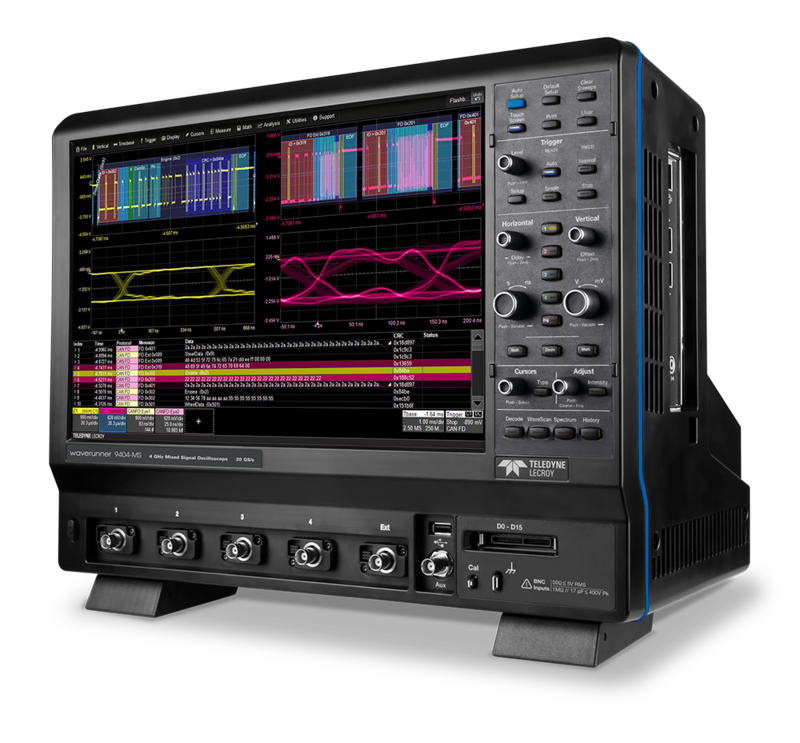 Teledyne LeCroy T3DSO1000 Oscilloscopes are a 2- and 4-channel series of high-speed waveform-capturing devices. The robust T3DSO1000 series can capture up to 400,000wfm/s (in sequence mode), using a 7-inch TFT-LCD to display 256-level, intensity-grading results at 800×480 pixels. 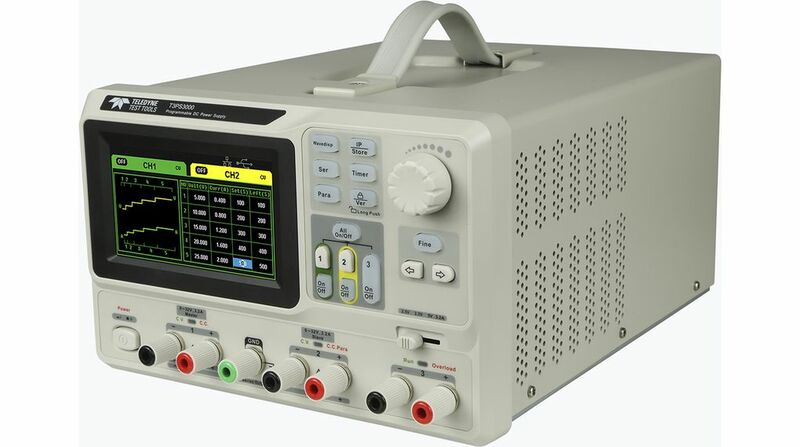 This family of oscilloscopes features 100MHz and 200MHz models, a digital intelligent trigger system, security erase mode, pass/fail functions, and USB compatibility. The 4-channel Teledyne LeCroy model is compatible with a number of accessories, including an AWG module, MSO software, and Wi-Fi® software. Sample rates up to 1 GS/s. 7” Bright TFT LCD (800 x 480). Serial Bus Trigger and Decode as standard – I2C, SPI, UART, RS232, CAN, LIN allowing users to debug serial buses directly in the Oscilloscope. 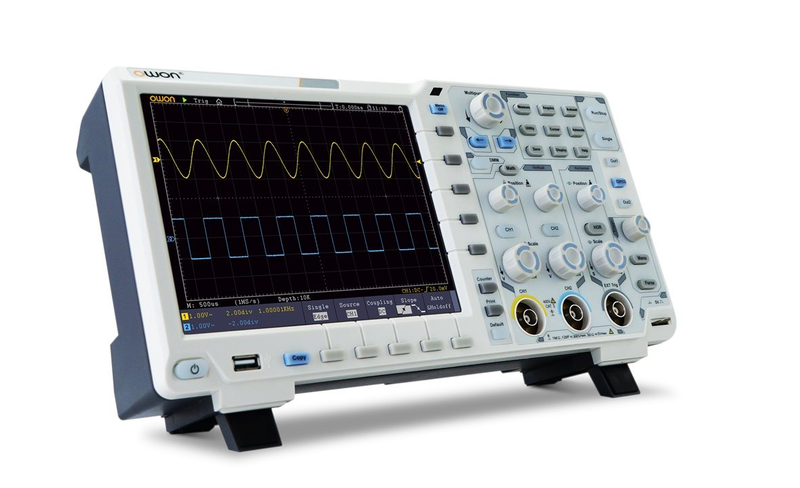 Optional MSO – 16 Digital Channels (4 channel models only) which adds mixed signal debugging to the Oscilloscope. Advanced Trigger – Edge, Slope, Pulse Width, Window, Runt, Interval, Time Out (Dropout), Pattern. Waveform Sequence Recorder – record and playback up to 80,000 waveforms. Allows users to replay the changes which have occurred in their waveform history. Connectivity – USB for mass storage, printing and PC control, plus LAN for fast data transfer. Using hardware-based Zoom technology the maximum record length of up to 14 Mpts, users are able to over-sample to capture longer time periods at higher resolution and use the zoom feature to see more details within each signal. Two channel series have one 1 GSa/s ADC, four channel series have two 1 GSa/s ADCs. When all channels are enabled, each channel has a maximum sample rate of 500 MSa/s. When a single channel per ADC is active, it has sample rate of 1 GSa/s. The T3DSO1000 series employs a new generation of high speed display technology that provides excellent signal clarity, fi delity and performance. The system noise floor is also lower than similar products in the industry. It comes with a minimum vertical input range of 500 uV/div, an innovative digital trigger system with high sensitivity and low jitter, and a waveform capture rate of 400,000 frames/sec (sequence mode). The T3DSO1000 also employs a 256-level intensity grading display function and a color temperature display mode not found in other models in this class. 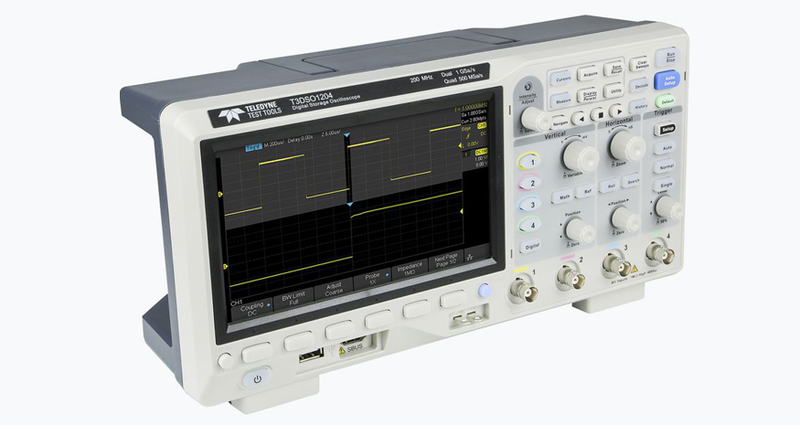 Teledyne Test Tools latest oscilloscope offering supports multiple powerful triggering modes including serial bus triggering. Serial bus decoding for IIC, SPI, UART, CAN, LIN bus types is included. The models also include History waveform recording, and sequential triggering that enable extended waveform recording and analysis. Another powerful addition is the new 1 million point FFT math function that gives the T3DSO1000 very high frequency resolution when observing signal spectra. The new digital design also includes a hardware co-processor that delivers measurements quickly and accurately without slowing acquisition and front-panel response. The features and performance of Teledyne Test Tools new T3DSO1000 cannot be matched in this price class. The four channel series includes even more functions, including: searching and navigating, on-screen Bode plot, 16 digital channels (Option), an external USB powered 25 MHz AWG module (Option), a USB WIFI adapter (Option), and an embedded application that allows remote control via web browser.